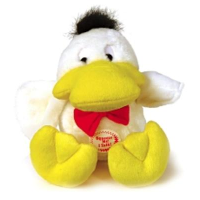 Chatterbox Duck Dog Toy is part of a range on plush toys containing a fun and realistic sound chip. The Chatterbox Duck has been made using extra soft material which has been tightly stitched with no small parts or beads. This toy can be used to play with or as a comfort toy and the life like noise adds extra entertainment and helps stimulate your pets natural instincts.